Liposuction slims and reshapes specific areas of the body by removing excess fat deposits, improving your body contours and proportion, and ultimately, enhancing your self-image. 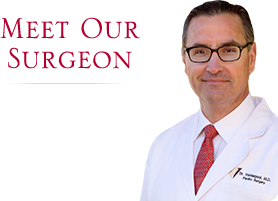 Board certified plastic surgeon R. Douglas Vanderpool, MD offers liposuction, also called lipoplasty, to men in women in Fayetteville, Arkansas who wish to refine their bodies to better reflect the results of diet, exercise, and a healthy lifestyle. In some cases, liposuction is performed alone, in other cases it is used with plastic surgery procedures such as breast reduction or a tummy tuck. Dr. Vanderpool uses the SlimLipo™ dual laser to efficiently melt and liquefy fat, which is then gently removed from your body. In addition, the heating of dermal tissue has been shown to have skin tightening results, which result in a smoother contour to the treated area. If you are bothered by excess fat deposits – located anywhere on your body – that don’t respond to diet or exercise, liposuction may be right for you. The best candidates for liposuction are at or near their ideal body weight, but have localized concentrations of fat that remain due to genetics or result from changes to the body such as those experienced during pregnancy and childbirth. In choosing Dr. Vanderpool, a member of the American Society of Plastic Surgeons, you can be sure that you will receive the highest standard of safety, expertise and care. Our goal is to promote self-confidence, renewed enthusiasm for life, and improved appearance, revealing your true strengths while reflecting your inner beauty.